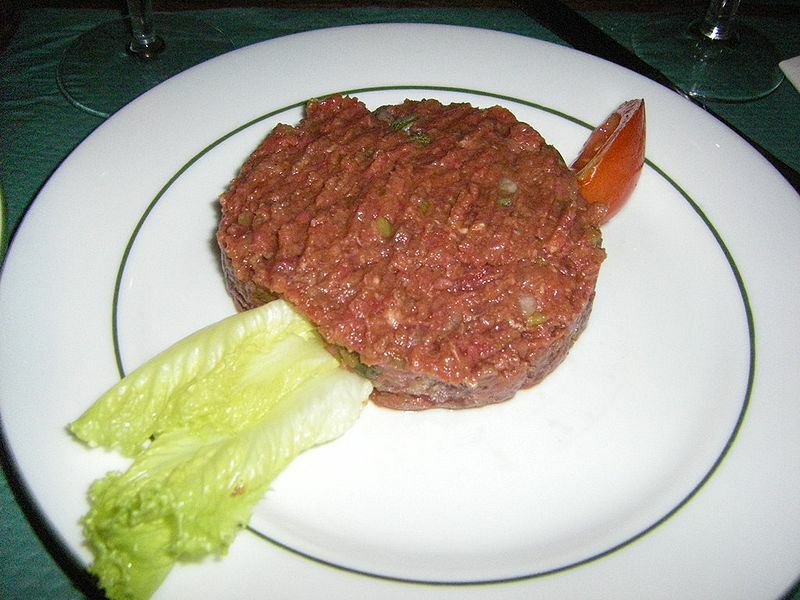 Steak tartare is a meat dish made from finely chopped or ground raw beef or horse meat. Tartare can also be made by thinly slicing a high grade of meat such as strip steak, marinating it in wine or other spirits, spicing it to taste, and then chilling it. Left: Steak tartare with egg, capers and onions. It is often served with onions, capers and seasonings (the latter typically incorporating fresh ground pepper and Worcestershire sauce), sometimes with a raw egg, and often on rye bread. A popular legend is that the dish is named after the nomadic Tatar people of the Central Asian steppes, who ate raw meat as they rode their horses because they did not have time to stop and cook. A variation of this story is that the meat was kept under the horse's saddles to be tenderized by the day's riding. In fact, steak tartare got its name from tartar sauce. It was first served in French restaurants early in the 20th century. What is now generally known as "steak tartare" was then called steak à l'Americaine. Steak tartare is now regarded as a gourmet dish. It is especially popular in Belgium, the Netherlands, Northern Germany, France, Poland, Hungary, Switzerland, Slovenia, Czech Republic and Slovakia. Left: Steak Tartare in a restaurant in Paris. A variant of steak tartare (called tartarmad) is also present in smørrebrød where it is served on rugbrød with assorted toppings. 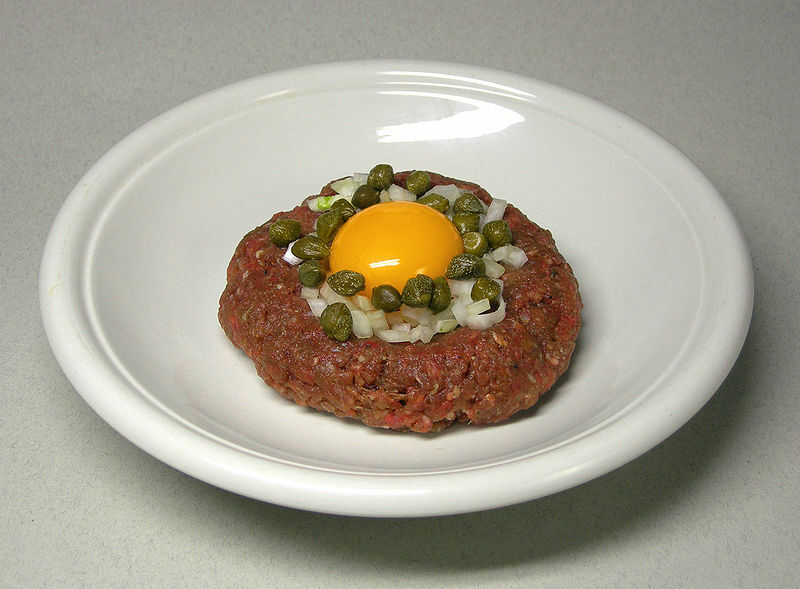 In Germany, there is a very popular variant using raw minced pork called Mett or Hackepeter, which is typically served on rye bread or rolls, with the onions and pepper, but without capers or egg. The Mexican version of steak tartare typically marinates the meat in lime juice, while the standard version is marinated in wine.